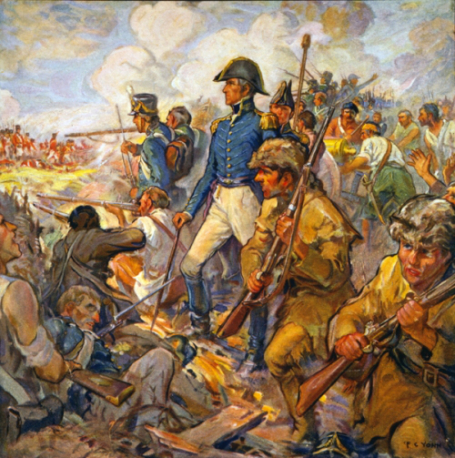 Daniel Haston and his children lived through the historical period of the War of 1812 (June 18, 1812--March 23, 1815. Although Daniel was too old to fight in this war, one of his sons, Isaac, is known to have participated in the war. See the Isaac Haston timeline. As the popular song from the late 1950s said, Isaac "took a little trip, along with Colonel Jackson, down the mighty Missisip." Isaac fought in the famous Battle of New Orleans that promoted Andrew Jackson to national prominence. David Haston paid a William Jones to go to war for him. That was a perfectly legal and noble option at the time. We do not have any record of any of Daniel's other sons' participation in the war or their reasons for not participating.